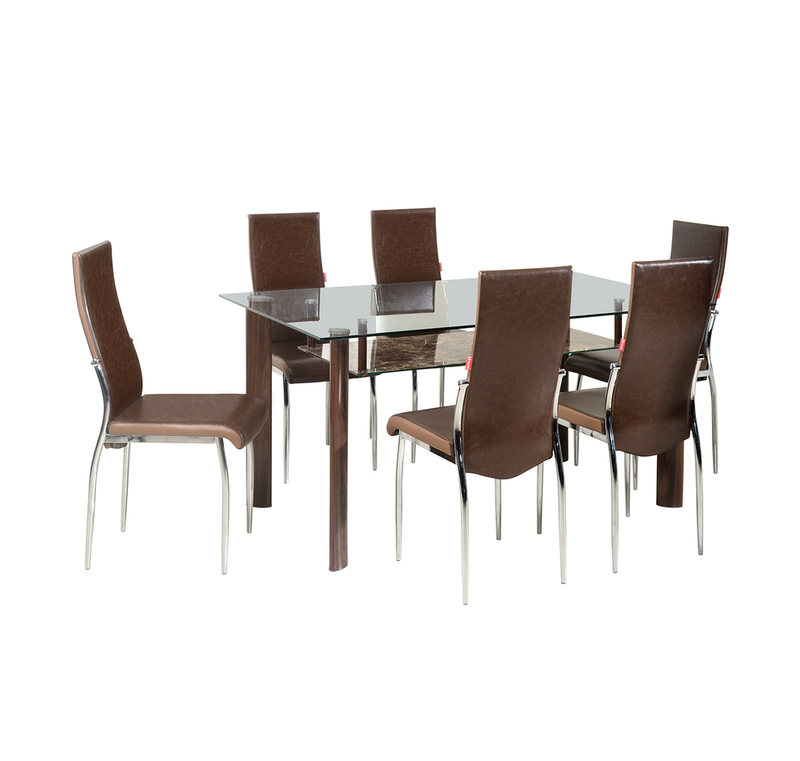 This dining table upholstered with PVC material that makes it more valueto your dining room. You can add a fashionable look to your home with this dining set which has tempered glass on top of the table. With an innovative and modern design, this dining set has 6 chairs and a table with glass on top which blend perfectly tradition with modern. The set made up of metal heat transferred table legs and chair leg with a chrome finish which gives it a classy appearance. You can match thesestylishchairs with any décor and bounce your home with its eye-catching look which can grab every person’s attraction. The dining set is valuable as it is a compact and ideal space saver. It is more easy to underneath the table with a shelf to save storage and ideal for every place of home. If you are searching for furniture that is designed to give an elegant and classy look to home and can accomplish needs of a family meal together then this 6 seaterdining set is favorable for everyperson. You can also useglass table of the set solo to décor any other part of your home with some flowers and rabbles to fascinate anyone. Contemporary look 6 Seater Dining Set with Glass Top.Compact & Ideal Space Saver.Table with shelf underneath for storage.Stylish chairs that can be matched with any Décor.